You get into your car to start your day, but all of a sudden, the smell of your hair product and cologne is quickly subdued by another smell. A not-so-glorious one. It’s the smell of mildew, a sign of a windshield leaking problem. Fortunately, you’re not the first one to face this problem. In fact, statistics show that the most common automobile insurance claims for U.S. drivers involve windshields — at 30%. And a whopping 70-80% of this 30% of claims involve edge cracks. But there’s no reason to drown in despair. Here’s what to do if you’ve encountered a leaking windshield. Maybe these signs don’t immediately scare you. For example, perhaps mold doesn’t trigger allergy issues for you, so you don’t feel the pressure to solve the problem right away. The mold might not stop you in your tracks, but a serious computer failure stemming from a leaking windshield certainly will. Windshield leaking can also cause electrical issues such as sensor failures, the rusting of your pin connectors, and windows that fog up as a result of high humidity in your car. These aren’t problems you can ignore for long. Not only that but also your windshield plays an important role in your car’s structure. It essentially gives your entire car stability, so a weakness in your windshield can put you and your entire family at risk of injury or even death in the event of a car accident. Oftentimes, a leaking windshield is simply the result of a poor installation job, particularly if you just had the windshield replaced. At the time of the job, the correct quantity of urethane might not have been used, thus preventing the windshield from sealing properly. Another potential cause of windshield leaking following an installation job is that your technician didn’t wear gloves when setting the windshield, so oils from his or her hands prevented the urethane from sticking to your window. In addition, the technician might have failed to use setting tools or vacuum cups, perhaps because he or she received no training on the use of this equipment. Another possible issue is that your technician completed your installation job in snowy or rainy conditions, as urethane will not adhere to a damp surface. If you have an older car, this may also be the reason for your leak, as older vehicles used rubber gaskets that ended up deteriorating over time. Today’s windshields instead adhere to the vehicles’ bodies to provide watertight seals as well as the support needed for airbag systems during possible motor vehicle collisions. Don’t just assume that the water inside your car is due to windshield leaking, though. Sure, water can easily invade your car’s interior through a windshield that is either faulty or cracked. But it can also enter through the vents of a broken car air conditioner or even through the car’s body. Leaks can additionally happen around doors or sunroofs that are not sealed adequately. That’s why we suggest performing simple tests to verify that a windshield leak is indeed the culprit. Finding your leak’s source can be more difficult than it sounds, and testing may be a time-consuming process, but fortunately, you can do the testing yourself. Let’s go over a couple of options. For this test, close all doors and windows, and then, shower the outside of your automobile with water from a garden hose. Start at the lowest point of the windshield, and then, slowly work your way up while an assistant inside the vehicle searches for where the stream begins to enter the cabin. Use low water pressure, as too much force will cause the water to simply bounce off the car. Be cautious if you use this test, though. Make sure that you protect your vehicle’s interior from potential water damage in the event that you discover a windshield leak. This test first involves applying soap to a wash mitt. Then, rub the soap onto the trim area of your windshield’s exterior, and finally, turn your car’s heater blower to defrost. Alternatively, have an assistant blow air onto the windshield’s edges from inside the car using an air nozzle. As you stand outside, look for soapy bubbles. They will tell you where your leak is happening. If you’ve found your leak, you can now fix it with the proper materials. First, take off your windshield’s exterior trim, and use paint thinner or another adhesive remover to clean the area under and around the seal. Then, dry the area, and apply brand-new sealant to your windshield beneath the seal. Finally, smooth any rough areas using an index card. After giving the sealant several minutes to try, repeat your water test to see if your repair did the trick. In all your sealing bliss, however, don’t make the mistake of using the “S” word — silicone — as silicone contracts and expands in the cold and heat. On top of that, you can’t complete a resealing job with the right sealant because it will not stick to silicone. If you still can’t seem to stop the windshield from leaking, that’s where we step in. Your leak might not be close to its source, as water may travel a long distance before it reaches your vehicle’s interior. This can easily throw you off when you’re attempting to diagnose the problem yourself. However, we have the skills and equipment to diagnose your problem and to repair or replace your windshield depending on your unique situation. Trust us to get the job done so the problem doesn’t continue to come up for you. 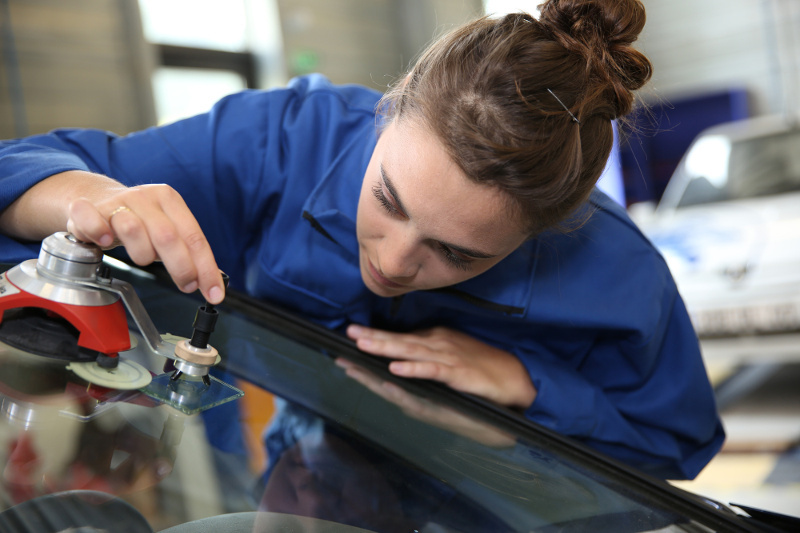 Have a question or concern about your vehicle’s auto glass? Contact us to talk about it!